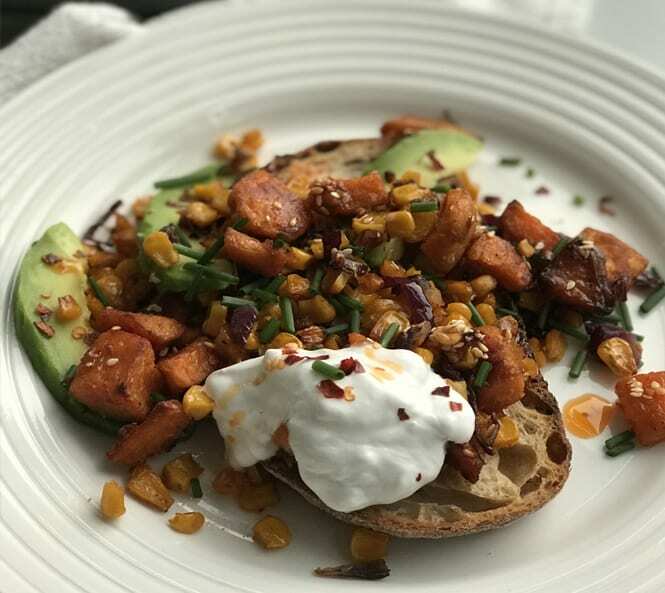 Start your day off right with this delicious Sweet Potato Hash! Our Garlic Roasted Sweet provide the perfect base for this hearty and wholesome breakfast dish. It’s a delicious vegan alternative to traditional breakfast hash, delivering plenty of fibre and healthy fats alongside robust flavours. Preheat oven to 200 °C. Cook the Garlic Roasted Sweet Potato Chunks, take out after 15 minutes and dice into smaller chunks. Dice red onion and drain sweetcorn. Add the cumin, corn and onion to the sweet potato tray and and cook for a further 10 minutes, until caramelised. Assemble the hash onto the bread, finish with some avocado, a dollop of yoghurt, some chilli oil for some spice and serve!